Welcome to August! With the first day of school swiftly approaching in many of our households, what better month to focus on shaping up our household routines? 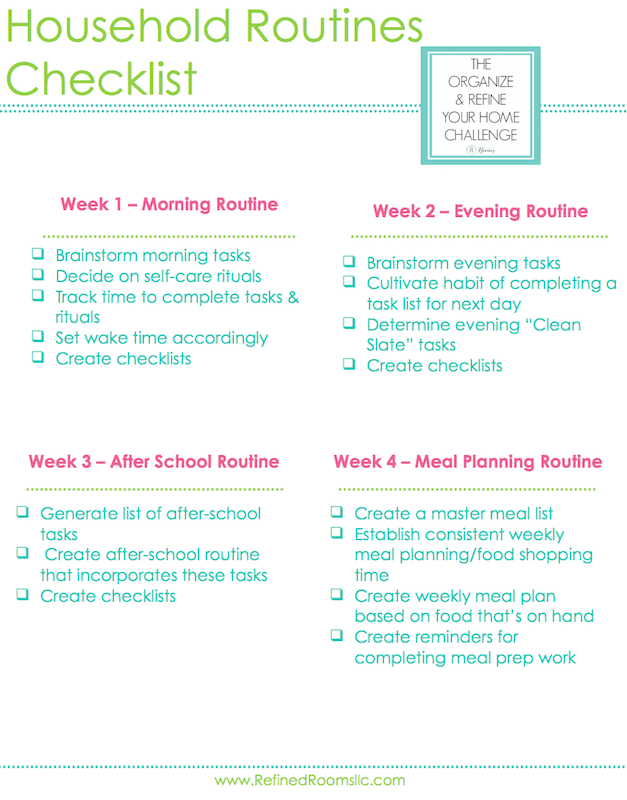 That’s exactly what we’re doing for this month’s Organize and Refine Your Home Challenge assignments. No better place to start than with our morning routine; am I right? Remember how I confessed a few months ago that I created the print photo organizing challenge primarily for my own benefit? Well folks, it’s the same deal for this month’s challenge assignments. You see…this was a different kinda summer for me. In stark contrast to how I typically operate, I really let my hair down and kicked my feet up as I made spending time with my family a major priority. It was GLORIOUS. But now I’m paying the price as the first day of school is swiftly approaching (like in 9 days). The teacher assignment letters are arriving, the online school form deadline is looming, and I have yet to make the yearly half-day pilgrimage to Target for school supplies. Did I mention that the current bedtime for my kids is in the 11:00 p.m. hour…and they’ll need to be waking up on school days between 6:15-7:00 a.m.? This week, they’ve been crawling out of bed between 10 a.m. and noon, then sitting around in their PJs for another hour or two watching reruns of Olympic swimming (both kiddos are swimmers, so this week is like Christmas for them). Needless to say, our morning routine is in SERIOUS need of an overhaul. 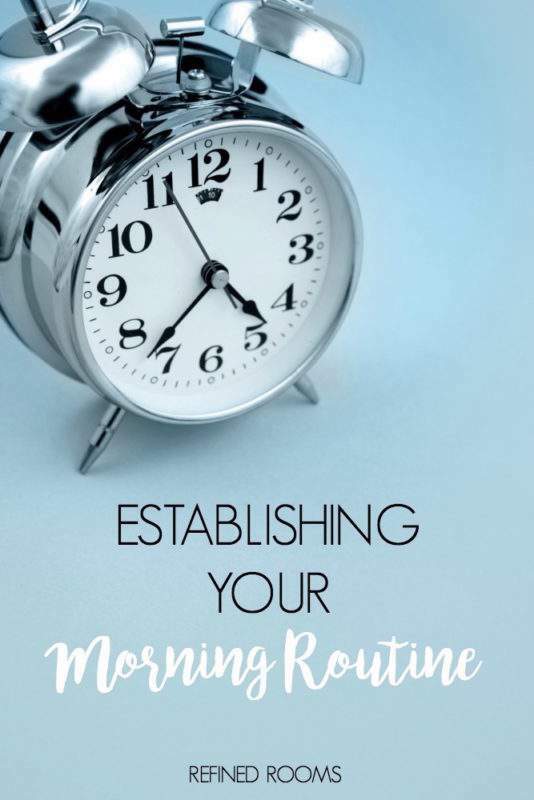 WHY ESTABLISH A MORNING ROUTINE? Nailing down a morning routine in your household sets the stage for a more organized, productive day with less stress and more peace. We’ve all had days where we rolled out of bed without a plan, and navigated our way out the door in a frenzied, disorganized manner. Don’t know about you, but I find myself feeling ill-prepared to face the world on days like that, which tends to turn into a self-fulfilling prophesy for me. In contrast, when we begin our day in a planful/intentional way, we face the day feeling confident and prepared to tackle the world. Aaaahhh, feels much better, right? WHAT WILL YOUR MORNING ROUTINE LOOK LIKE? Your morning routine needs to be customized, based on your unique situation and season of life. If you’re like me and your household includes a family with school-aged kids, your routine will obviously be somewhat dictated by the school day schedule. It will need to incorporate all of the tasks involved with getting the kids to school on time with everything that they need for that day. Related: check out these 10 back to school organizational tips to set your kids up for a successful year. Using a checklist to help your kids navigate their morning routine can be hugely beneficial. We’ve used checklists to reinforce morning routines since my kids were itty bitty. The content of the checklists has changed over time (they no longer need to be reminded to Go Potty when they wake up), but the process of listing out all of the tasks they need to accomplish prior to getting on the bus has remained the same. You’ll need to operate within the constraints of your other family member’s needs when creating your own morning routine. But don’t let that stop you from including actions and tasks that you’ve prioritized as important for yourself. The mornings can be a great time for incorporating self-care into your day. Maybe you’ve set a goal to meditate each morning, or to start the day with a brisk walk. It could be as simple as allowing yourself 10 minutes each morning to indulge in some reading while you savor a cup of coffee. Doing something each morning that feeds your soul and/or moves you closer to a personal goal can really energize you as you set out to tackle the day. Need some ideas for crafting your morning routine? Take a look at this unique archive of morning routines for some inspiration. I’ve definitely struggled with chaotic mornings in my household over the years. Earlier this year, I discovered Crystal Paine’s Make Over Your Mornings course. This course really helped me to bring order and peace to my household, while putting together a plan for accomplishing all of the essential tasks that have to be completed in those first few hours of the day. I completed the course earlier this year, and now I’m re-watching it and completing the exercises again this fall as we prepare for the new school year to start (you get lifetime access to the course so that you can watch it repeatedly as your life circumstances change). Click here to learning more about the Makeover Your Mornings course. I’d love for you to share the details of your new morning routine via Instagram (use the hashtag #OrganizeandRefineChallenge and don’t forget to tag me) and/or share it in the comments below! Thanks Nicole! Come back and let me know how it’s working for you! It is so easy to get off a morning routine during the summer months! I can’t wait to establish a routine again. You said it Renee! Me too!